"Come Fish A Nawlins Good Time!!" I’m Capt Jason Shilling owner and fishing guide of this New Orleans Fishing Charter for red fish and speckle trout. I fish the back water marsh, lakes, bays, and bayous of Lafitte, Louisiana. Located just 40 mins south of New Orleans, Lafitte is home to some of the finest inshore fishing the New Orleans area has to offer. 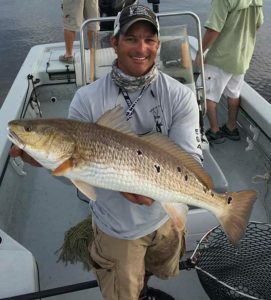 Catching the hard fighting red fish and the paper mouth speckle trout daily, as well as a variety of other species of fish such as black drum, flounder and sheepheads. My New Orleans Fishing Charters are private charters for anglers of all skill levels of fishing. So if you’re an experienced angler or a family of first time fishermen, I will cater to everyone and have y’all reeling in fish in no time. My New Orleans Fishing Charters begin at safe light from Nick’s Marina and run 6 hours. A $10 fishing license is required for anyone 16 years old or older. This license can be obtained easily in advance by phone or online. As a local of the Lafitte and the New Orleans area, I (Capt Jason Shilling) know all the hot spots to take you to catch your share of fish in my 22 ft custom bay boat that’s powered by a 200hp Mercury Optimax. This boat is equipped with all that is needed to accommodate up to 4 people plus the captain. Larger groups are welcome with advance notice. I (Capt Jason) have a network of professional captains available to take you on your New Orleans Fishing Charter if I’m already booked for the day. These New Orleans Fishing Guides are United States Coast Guard licensed captains and locals of the Lafitte area. We have been fishing these waters our whole lives and know how to show y’all the true meaning of Fishing New Orleans Style with southern hospitality, good times, and lots of action. I will take you on a fishing adventure you won’t soon forget. Here at New Orleans Style Fishing Charters we don’t just go fishing we make memories. For Larger Groups, Advanced Notice Is Requested. Lodging and Fishing Packages are Available. $150.00 per day deposit required to reserve boat for the day. A seven-day-advanced cancellation notice required for return of full deposit. Fishing isn’t just for the experienced! If you’ve only fished a few times or if this is your first time, Capt. Jason Shilling can have you reeling in fish from the sportsman’s paradise in no time! A visit to New Orleans isn’t complete until you’ve fished and enjoyed the scenery of South Louisiana’s marsh land and the bayou’s of Lafitte. “Thanks for the wonderful day of fishing we had with you today. You are a superb host and guide and it was such a thrill to catch our beautiful redfish. In all my time of saltwater fishing, I have never caught so many and so large. When we get back to Galveston, we are going to have a party with our extended family and FEED THEM ALL!! !